In 2014, QAHN broke with tradition by awarding the Marion Phelps Award to two remarkable individuals – in fact, two siblings, Louise Hall and Adelaide Lanktree. The award was presented at QAHN’s 2014 convention in historic Stanbridge East, Quebec. 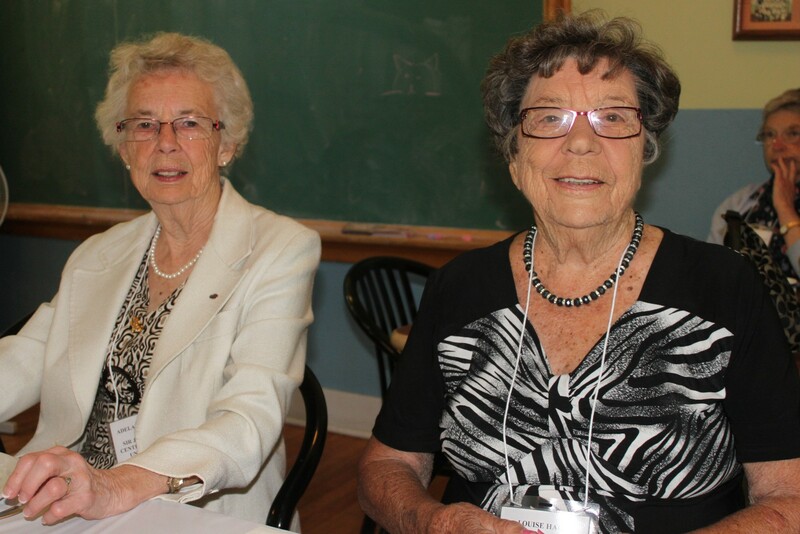 Between them, Louise Hall and Adelaide Lanktree, both retired school teachers, and both icons of the Eastern Townships, have totaled well over a century's worth of outstanding volunteer contributions to their community and to several heritage organizations. For more than twenty years, Louise and Adelaide have been active members of the Sir John Johnson Centennial Branch of the United Empire Loyalists' Association of Canada, an association dedicated to the preservation of the history and heritage of those Loyalists who were the first settlers of the Eastern Townships. Adelaide was the treasurer of the Sir John Johnson Branch from 1993 to 2003, and president from 2003 to 2007. Louise has been the treasurer since 2003. Adelaide is the treasurer of La Société de restauration du patrimoine Johnson, a group that has been working diligently towards the restoration of the Sir John Johnson burial vault on Mont Saint-Grégoire which was destroyed in the 1950s. The vault has now been rebuilt and the remains of the Johnson family will soon be returned to it in a ceremony later this summer. According to UELAC Past President Fred Hayward, "without the persistence and patience of Adelaide and Louise, the rededication of the Sir John Johnson Family Burial Vault would not be taking place this summer as part of the centennial events of our Association." Louise has volunteered at the Brome-Missisquoi Perkins Hospital in Cowansville for 70 years (a world record?). Since 2002, she has been a member of Le Petit Musée BMP Heritage, a museum committed to the preservation of the hospital's history. Both Adelaide and Louise have been longtime members of the Missisquoi Historical Society in Stanbridge East. For over ten years, they have served on the Comité du patrimoine in their hometown of Farnham. Louise founded the Farnham municipal library, now named the Louise Hall Municipal Library. They have been supporters of QAHN since the organization's beginnings, as well as the Townshippers' Association, their local United Church, the Order of the Eastern Star, and the Red Cross. According to nominator Jim Caputo of the Quebec Anglophone Heritage Network, "No one that I know of more deserves this honour and displays what Marion Phelps stood for." Michel Racicot, a genealogist with the Sir John Johnson Centennial Branch of the UEL, introduced the sisters at the awards ceremony. He described them as ranking "among the finest examples of true volunteerism."